Chapter 1: "The Snows of Summer"
The Reign of Winter Adventure Path begins with an exciting new adventure from RPG Superstar winner Neil Spicer! Every 100 years, the Witch Queen Baba Yaga returns to the nation of Irrisen to place a new daughter on the throne, but this time, something has gone wrong. Far to the south, winter cloaks the forest near the village of Heldren with summer snows. The heroes venture into the wood and discover a magical portal to the frozen land of Irrisen, whose supernatural winter will soon engulf all of Golarion unless they can discover the fate of the otherworldly witch Baba Yaga—a quest that will take them through snowbound Irrisen to even stranger lands beyond. “The Snows of Summer” is a Pathfinder Roleplaying Game adventure for 1st-level characters. This volume kicks off the new Reign of Winter Adventure Path, and includes a gazetteer of the villages of Heldren and Waldsby, details on the cultural and magical legacies of Irrisen, and several new monsters in the Pathfinder Bestiary. Author Kevin Andrew Murphy launches a new Pathfinder Journal novella in this exciting volume of the Pathfinder Adventure Path! 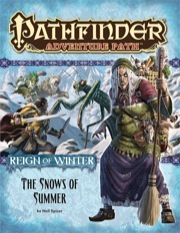 The Snows of Summer is sanctioned for use in Pathfinder Society Organized Play. The rules for running this Adventure Path and Chronicle sheet are available as a free download (639 KB zip/PDF). I’m a player that bailed on a game 80% of the way through this. This book has a premise of having the players save the world when Golarion is full of very high level NPCs that any sane party would pass that torch to. This adventure path requires (among lots of other retcon surgery) that it not be set in setting like Golarion. This book was a succession of “Why am I even here?! ?” questions. Leave this one on the shelf unless you have lots of time for major plot rewriting. Not standing up to the test of time. I am a big fan of Paizo APs (I have played/GM'd 7 including this one) and this has been my least favourite. Book 1 is just one long rail road with little motivation apart from "the world is in danger" for a basic party. The plot hook just isn't developed enough for myself. There are too many encounters that are unnecessary (out of the first 13 encounters, 11 are combat based. One of these is 1 encounter that combines 3). The GM was advised in the book to put us under a compulsion spell to make sure we stayed on the path the adventure wanted us on. I do not think this is good AP planning to encourage good roleplay. I do love Paizo APs but this one just doesnt stand up to some more recent APs whose quality are outstanding. An interesting start to a campaign. Lots of role play and some interesting encounters to keep the combat types happy. I have two grumbles though. One is that the encounters seem arbitrary, just set to sow off the events taking place. I'd have much preferred to just get on with the story than keep having to have unnecessary encounters when GM description will do. Secondly, like most AP's, there just isn't the opportunity to sell stuff and buy equipment. After several AP's this just gets old. I just finished taking a group of 4 PCs through the module. While we had a lot of fun, I still had some gripes with a few things. The trek through the Border Wood is a string of seemingly disconnected encounters. Yes, I get that most of them are there to illustrate the transformation of the woods but it felt like a theme park ride from one "Here is a strange monster, kill it!" to the next. I definitely recommend to significantly condense this part down to the major encounters. I also did not like the way the Black Rider just forces the PCs to take up his mantle. Sure, good-aligned characters might have some issues with trying to help a supposedly evil witch, but this solution seems too imposing. Lastly, as written, the book fails to adequately introduce its final villain. The entire time the PCs think they are going to face a certain character but then end up fighting their out-of-office replacement who has not even come up in any way in the adventure. There is a line late in the book about how he scries on the party and how that should introduce him to the players but I don't really see how that would work. But it is absolutely not all bad. Plot-wise, this is the most epic exposition to an Adventure Path I have run so far. The PCs are sent off by the herald of an almost divine being to find out what happened to his mistress when they have just barely hit 2nd level! Also, Neil Spicer added some really nice touches to the encounters. Even the ice elementals have first names! Everything has a reason and a motivation for being where it is, they are just not very likely for the PCs to find out about, so in the end it just seems random to them (see above). I also liked the general atmosphere: The sense of dark fairy-tale and haunted forest comes across very well, right down to the wintery village oppressed by an evil overlord (or overlady, as it were). All in all, I rate this 3 stars because the plot and atmosphere are nice, but the trek through the forest was just too much of a drag to rate this any higher in my opinion. However, if you are willing to invest some time as a GM, I am sure you can easily add at 1 star. All the ingredients for a great adventure are there, you just need to throw them into a cauldron, stir, and cackle. This book has everything you want from the beginning of an AP. It really sets things up perfectly for the next lot of books, and really gets the characters invested in the plot. Rather than start out 'cold' (tee hee) in Irrisen, it lets them warm up (or cool down gradually) in the south before making a gradual and natural transition to wintery elements and wintery creatures, building nicely on what the players know and have experienced in an easy-to-approach fashion. The plot itself is incredibly engaging and gives a beautiful glimpse into just how epic the adventure path at large will eventually be. It does all this without seeming unreasonably out of place for low-level character either. Truly great work, and all of my players are now chomping at the bit for the second instalment. So rewarding to see as a GM. This is (so far) proving to be easily the best AP out there. Oh, and if you're GMing this, do yourself a favor and pick up the Campaign Setting Irrisen: Land of Eternal Winter. It gives you a lot more insight into the Jadwiga and Irrisen in general and you'll find your players thanking you for all the extra accents and details you'll be able to sprinkle in to your campaign. Work Horse Neil Spicer Starts it off! Reprising our tag-team from "Blood for Blood"! Excellent! I hope this can be adapted to start in the PCs kingdom in the Stolen Lands. If we pull it off like we hope, you can adapt the start to begin anywhere. Santa walked into the briefing room of the toy factory with a grim look on his usually cheery face. "We've got trouble. The Misses is missing. Worse, if we don't act fast, it will be always winter and never Christmas." That silenced the room full of rambunctious elves. All through the room not a creature stirred not even a mouse. Finally someone spoke. "What can we do?" "Prepare for battle. We will find her." See...even the north pole works. So many of us have fled from Helgen so many times already, I can't believe we're actually going towards the place now. I think Helgen is a typo. The outline I was given cited Heldren. Though I also know Rob went back and forth on the name for that town. So maybe it ends up Helgen? Or maybe it's all just some terrible illusion the winter witches have created to cloud and confuse our minds? Kevin Andrew Murphy is writing the Pathfinder Journal? Excellent! It's funny, because I just posted a question/comment ruminating on my desire for a Pathfinder Tales novel penned by Mr. Murphy. I just noticed that Kevin Andrew Murphy has THREE first names. I just finished NCO Academy, and one of the guys in my flight (from Kentucky) has three first names. Coincidence? I THINK NOT! Good news! We'll finally get an in-depth look at Irrisen and Baba Yaga. It's too bad that's a mockup. That cover looks badass. I wonder if we'll get a look at how Paizo deals with epic characters in this series eventually? In Witchwar Legacy, Irrivor was a lvl 20 witch and she was the granddaughter of the queen. Should mean that Queen Elvanna, and certainly Baba Yaga are 20+. Maybe we'll get some extra rules to deal with that stuff in the 5th or 6th Module of the series. Either way, looks like some promising stuff! Not in this AP, but you will see that sort of support in the subsequent adventure path, Wrath of the Righteous, which launches at Gen Con next year. See HERE for Paizo's answer to epic level rules: Mythic Adventures. I dunno, Baba Yaga seems kinda mythic, right? I really like the name of this adventure. The story sounds really promising!!! Love the baba yaga and portal to frozen realms thing! Never been a fan of winter-based monsters tho, and all famous ones from mythology/folklore are already in the bestiaries/previous AP (yeti, saumen kar, yukionna, wendigo), so i'm curious at what the monsters may be, I hope it ain't gonna be too much giants, linnorms and snow/ice versions of already done monsters, like snow medusa, snow minotaur, snow goblin, snow dwarf, snow cloaker, snow whatever, those are cheap. Fenrir is the only monster I can think off and he would look like a upgraded version of the winter wolf, and I hope this AP finally brings in the first picture of a Pathfinder Winter Wolf, the poor beasts don't have a paizo artwork yet. But anyway, bring it on!! Considering one of the APs is on Triaxus, the last two AP's locations are unknown and the first one will take place in an area that isn't used to "summer winters". I think it is safe to assume there will not be any "snow medusa", "snow minotaurs", etc. the guys at Paizo are much better monster designers then that. Excellent. My group will be finishing Jade Regent just in time. It is of intrest to note that George R. R. Martin said on more than one ocassion that the phrase "Summer Snows", which appears in the first chapter of the first book of A Song of Ice and Fire (not including the proloug) was very important for him and gave him the kick he needed to get serious about writing that book. May this AP be as awesome as that book turned out to be! seriously though, I dare Neil Spicer to make this his best adventure, ever. This AP really calls for a kickass start. Since Hardcovers have to go to the printer a month earlier then other products, so #6 and Mythic Adventures have to go to the printer at the same time. So stats for Baba Yaga wouldn't be out of the question. ...seriously though, I dare Neil Spicer to make this his best adventure, ever. This AP really calls for a kickass start. I'm just excited about this AP, and being able to remember the first module as "Neil Spicer's Best" would totaly make it all the more awesome to me. what's going to be the next god article? So wait, this adventure can start anywhere? Judging by the names of the towns, it looks like Avistan fits well, but would Garund be workable? I would love to see some more lupine and Fenris-inspired monsters myself, complete with art. From what we've heard, it will default to Taldor, but it will be reasonably possible just to cross out the place names and choose ones suiting where you want to start. Bingo. The very next issue of the AP series (Wrath of the Righteous #1) will be using Mythic rules so I think it's very possible for a cameo of the rules in Reign of Winter #6. Personally, I hope that we see Baba Yaga detailed with Mythic Rules in the Continuing the Campaign article. The playtest should be over, and most of the rules fully developed, by the time the CtC article needs to be written. I'd like to think whoever writes the CtC article (Daigle, I'm looking at you) will have access to the Mythic rules. The land of the midnight sun suddenly becomes forty days of night and no one notices? I've been in Alaska at midsummer when the sun never set. Locals told me I wouldn't enjoy the winter. I know, but its just so difficult to make up good snow/ice monsters, especially when it are gonna be so many of them, ive never seen and about to see the first good ice/snow monsters I hope, as mostly D&D, games and other such stuff always use ice versions of hydra's, medusa's, minotaurs, boars, cloakers and such uninspired horrors. But here my knowledge of ice creatures ends, Megafauna? I can't say i'm not extremly curious at what treasure paizo will give us in this AP. I wouldn't mind seeing snow goblins statted up, now that they are doing the same for the monkey goblins. Anyway, I would guess the reason we haven't seen too many Ice monsters is that only one AP so far has had a volume where they would be appropriate (The Crown of the World portion of Jade Regent). They had some cool Inuit monsters in that volume, so I have high hopes here that Paizo can produce some good critters. So, Heldren ("Helgen?") isn't on any map as of this point? That's pretty cool -- great decision. Heldren is small and generic enough that DMs can fit it in any of several Avistan regions -- and isn't on any official map so we can do what feels best for us individually. We're aiming for Heldren to generic enough to be placed anywhere, but it is actually somewhere specific in the Inner Sea region—it is a small Taldan town. Waldsby is a small town in Irrisen. At first that sounded cool, but then I realized that my level 17+ PCs would handle the situation themselves - so that wouldn't work well with the beginning of an AP. Any suggestions on how to handle that?